The Rangers have two games left and Lundqvist is stuck on 18 wins for the season, which means his NHL-record streak of consecutive seasons (13) with 20 wins is in jeopardy. Henrik Lundqvist had one last shot to keep his NHL-record streak alive and win 20 games for the 14th consecutive season. But after the Rangers lost to the last-in-the-league Ottawa Senators, 4-1, Wednesday at the Garden, that chance appears to be gone. The Rangers have just two games left, and Lundqvist is stuck on 18 wins (18-23-10) for the season, and 449 for his career, after his sixth straight loss. Rangers coach David Quinn said Alexandar Georgiev will start Friday’s home finale at the Garden against the Columbus Blue Jackets, and the starter for Saturday has not been determined. But the math is simple: Unless Lundqvist for some reason comes off the bench and gets a win in relief in Friday’s game, then there’s no way he can get to 20 wins this season. By all accounts, the Rangers (31-36-13, 75 points) were a no-show in their second-to-last home game of the season against the Senators, who improved to 29-45-6 (64 points). But they couldn’t. They fell behind 1-0 on Bobby Ryan’s power-play goal at 12:14 of the first period, and then, after Ottawa’s Cody Ceci was sent off for tripping 33 seconds later, the Rangers allowed a shorthanded goal to Zack Smith to fall behind 2-0. Brady Tkachuk’s 5-on-3 power-play goal made it 3-0 at 3:51 of the second before Lias Andersson scored the Rangers’ only goal of the game, a shorthanded effort to make it 3-1. Brian Gibbons scored for Ottawa with 5:02 left in the third to remove any doubt about the result. 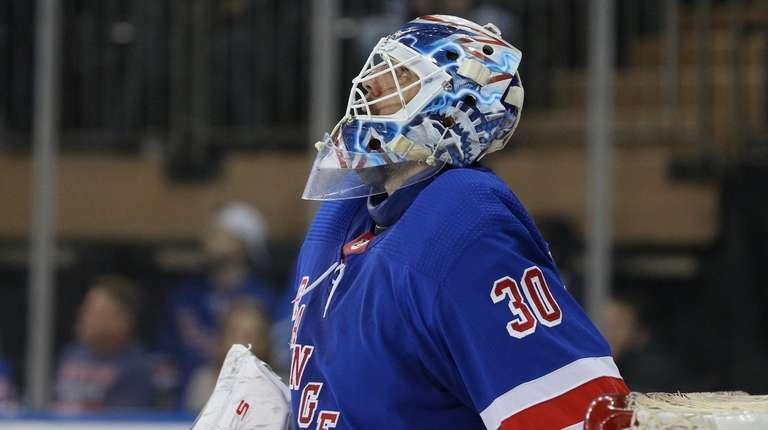 Lundqvist, who has praised Georgiev for his play this season, has said he understands why he isn’t playing three-quarters of the games, as he’s been used to. Georgiev has been better than him of late. Notes & quotes: Filip Chytil sat out the game with an upper-body injury after taking a check at the end of the Devils game. Quinn said Chytil was “OK, but not good enough to play,’’ but he listed him as “day-to-day’’ and didn’t rule out the possibility the 19-year-old could play this weekend… Forward Pavel Buchnevich, who sat out Monday’s game after an accidental hit near the end of Sunday’s game against Philadelphia returned to the lineup… Mika Zibanejad was named the winner of the Steven McDonald Extra Effort Award and presented with the trophy before the game… D John Gilmour returned to the lineup, replacing Freddie Claesson.